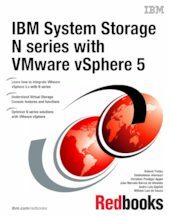 This IBM® Redbooks® publication provides a basic introduction to the IBM System Storage® N series, virtualization, and VMware 5.x. It explains how to use the N series with VMware vSphere 5 environments and the benefits of doing so. Examples are given on how to install and set up VMware ESXi server with the N series. The IBM System Storage N series used as a storage foundation offers unified storage solutions that provide industry-leading technologies in the areas of storage efficiencies, instantaneous virtual machine and datastore cloning for virtual servers and virtual desktops, and virtual data center backup and business continuance solutions. The information provided can be also be used as a foundation to create dynamic cloud solutions, making full use of underlying storage features and functions. This book provides a blueprint for how clients can create a virtualized infrastructure/storage cloud that will help to address current and future data storage business requirements. IBM System Storage N series in conjunction with VMware vSphere 5 helps complete the virtualization hierarchy by providing both a server and storage virtualization solution. Although this configuration can further assist with other areas of virtualization, networks, and applications, these areas of virtualization are not covered in detail in this book.